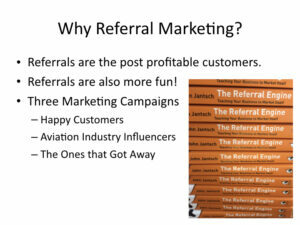 Why should aviation companies run specific referral campaigns? Won’t happy customers just naturally refer their friends and colleagues? 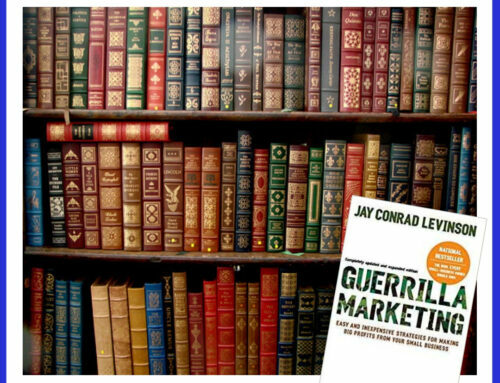 Don’t referrals just happen as simple, natural word of mouth marketing? The answer is yes, but you have to earn them! 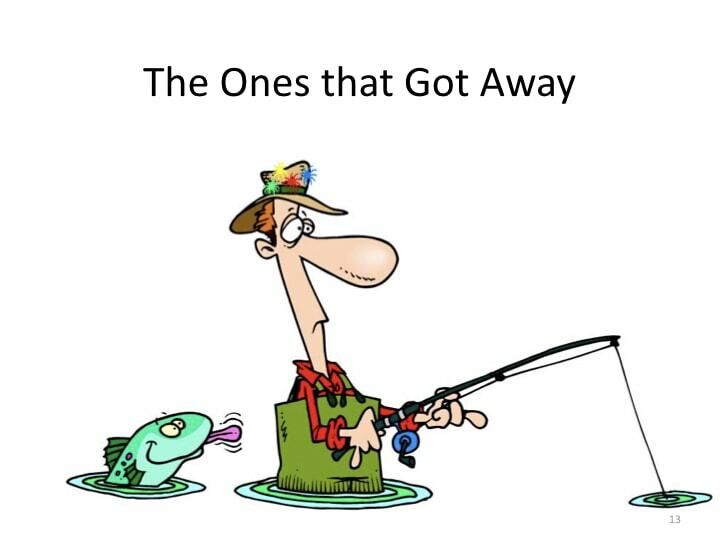 A company that provides outstanding products and services will get some referrals, but there are many reasons NOT to take customer referrals for granted. “. . . 63.4 percent of small businesses felt that over half of their business came by way of referrals. Referred prospects are less expensive to acquire. They become customers with a shorter sales cycle. Customers who have been referred are usually a better fit for your business model. They tend to remain customers longer and spend more money. Referred customers tend to refer other people! 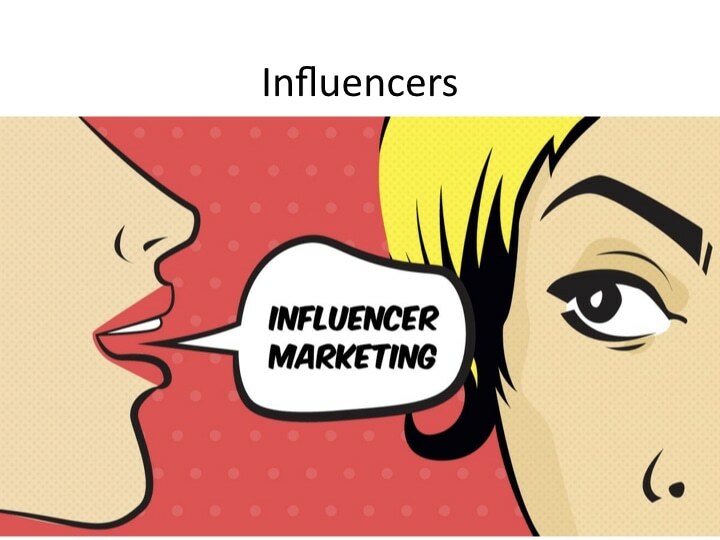 And, referral campaigns are fairly simple, inexpensive and have a great return on investment. 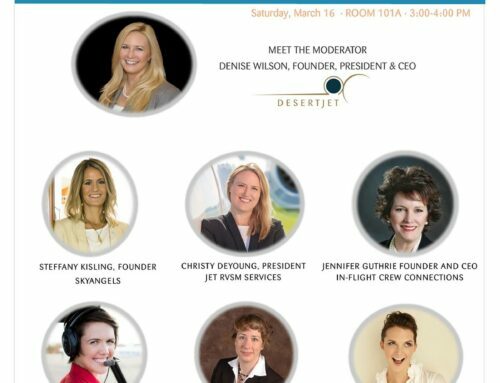 So, why are most aviation sales and marketing professionals so obsessed with reaching new customers? Why aren’t they devoting some of those resources to referral campaigns? 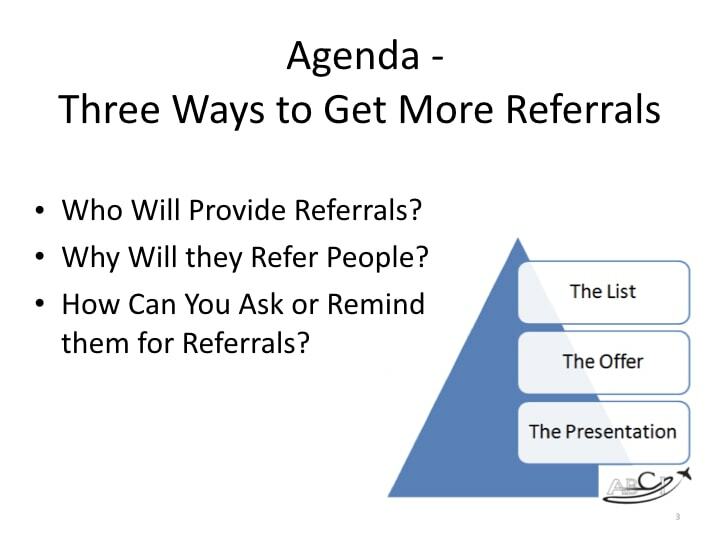 Of course, most simply take referrals for granted. Others have simply have not thought about it. 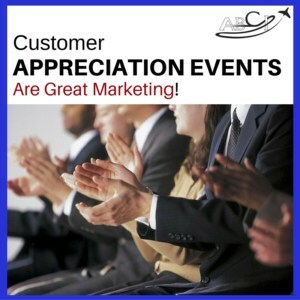 And a bonus – how to use Customer Appreciation Events as an opportunity to inspire more referrals! 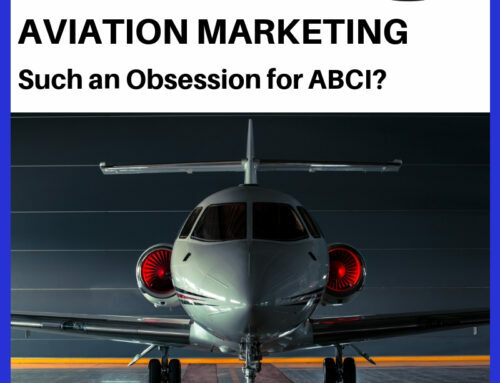 For each of these campaigns, we outline the three primary elements of aviation marketing campaigns – the list, the offer, and the presentation. Public thanks for customers who DO provide referrals. Transparency – let people know what happened to their referrals – did they become customers? Whether or not they ended up working with you, be sure they know you appreciate their efforts. 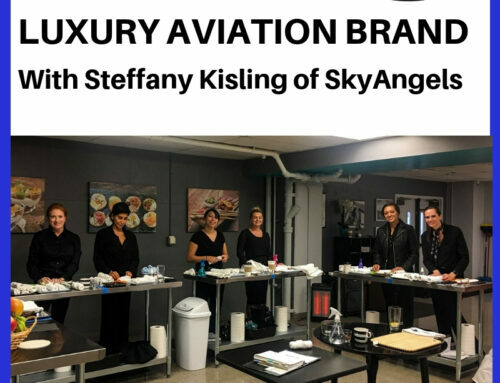 In the video, we relate this story about how many charter organizations apparently actively discourage direct referrals from their own pilots. We’d love to hear how someone (anyone?) is able to solve this problem! 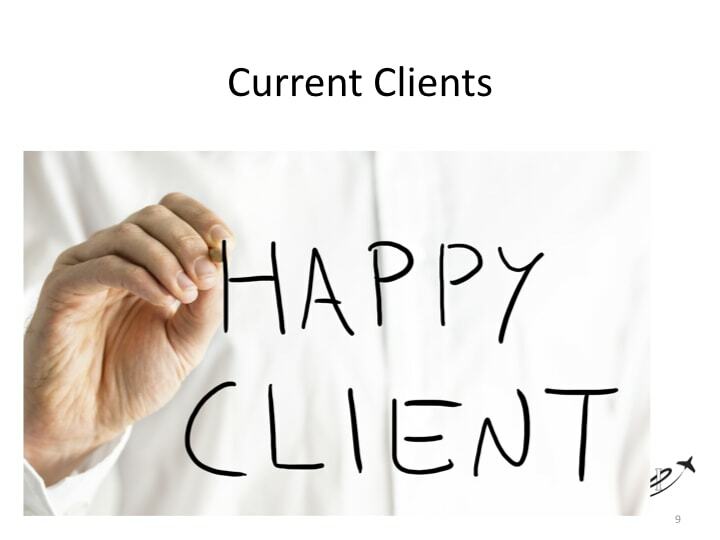 Your list should include brokers, insurance or legal professionals, maintenance techs, pilots, other connected folks who have the “ears” of your prospective customers. Financial (or other) incentive! If it’s legal and in good taste to offer a finder’s fee or commission. 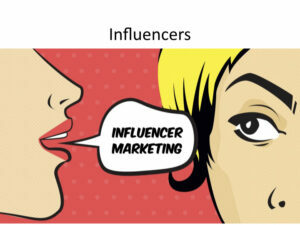 Connect with influencers on LinkedIn or at networking events. 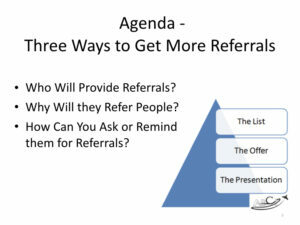 Make good referrals to them! Make it easy for customers to make referrals. 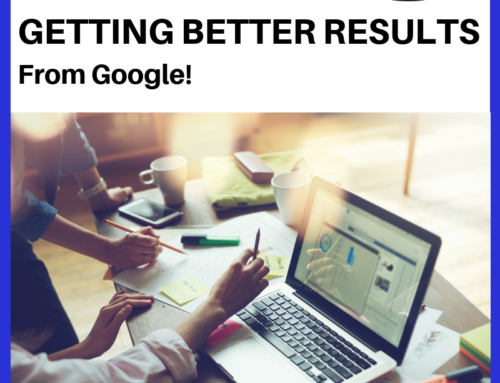 You might set up a referral link and a landing page for your “refer a friend” program. Include a form for people to complete whenever they happen to think of a good referral. Prospects that don’t work out for some reason. You’ve given them a sales presentation and they liked some of what they saw, but they never ended up doing business with you for some reason. (Most companies close less than 50% of the sales presentations they make for various reasons, so we should have no shortage of these! A survey after a consultation or sales presentation. Stay in touch with high-value market updates, etc. Ask periodically in your newsletters or other communications. Another great way to get referrals is to invite existing customers and prospects to an annual customer appreciation event. 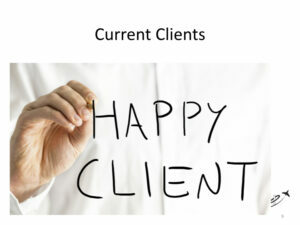 About 75% happy customers to 25% prospects is a good ratio. You don’t usually need to make a formal offer, just let these folks mingle and talk to one another. Naturally, they will end up talking about your area of expertise, their experience with you, and so on. This can be an informal breakfast. Or a huge get-together at an amusement park, depending on your budget, the number of people participating, and the customer lifetime value. 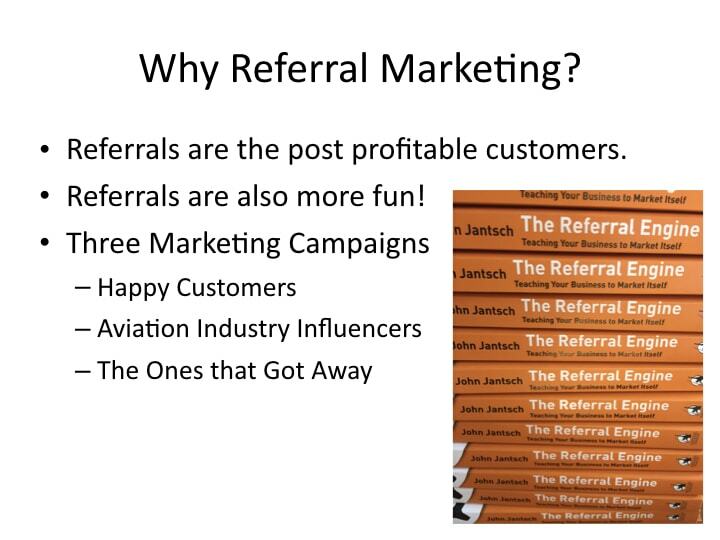 Referral Campaigns are Incredibly Effective! 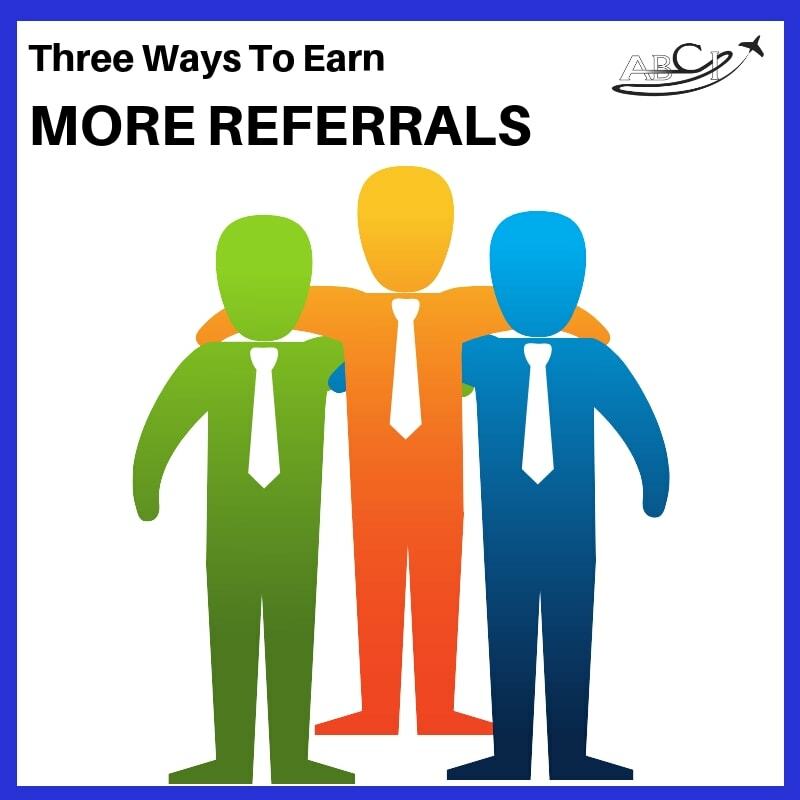 We think every aviation company should be involved in several referral campaigns – some annual, some ongoing, some formal, and some informal. So. adding a few of these efforts to your current mix of sales and marketing activities will undoubtedly improve your bottom line! Interesting and helpful information. Thank you for sharing. Carolina at GSE Solutions.